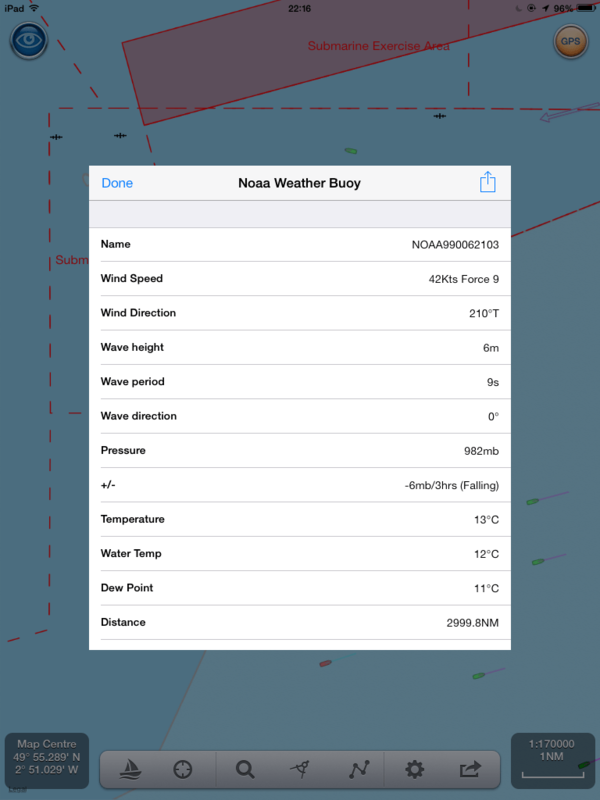 NavLink UK is a new app from Digital Yacht that will be available on the Apple app store very shortly. It’s a full featured electronic chart display with real time navigation and excellent UK Admiralty digital charts. It can also gather data from weather buoys so I clicked on the Channel Light vessel to get an immediate indication of local conditions. More on NavLink next year but look at the results from last night. 42 knots of wind from the SW with a 6m swell running short with a 9 second period and a barometric pressure drop of 6mb in 3 hours. Rather them than me and a place to be avoided. NavLink shows lots of exciting data like this. Anyway, I’ve asked Santa for an iPad Air and NavLink shouldn’t break the bank at £19.99 – coming soon…….